You can now win the biggest Casino jackpot ever! At $4.8 million (approximately €3.47 million) and climbing, this is your best chance to become an instant, multimillionaire. While playing Beach Life progressive jackpot slots is always fun, there’s nothing like a couple of million on the line to really up the adrenalin rush. In a single spin, the ultimate jackpot could be yours. All you need to do is make a deposit at a top playtech casino like Europa Casino, Casino Plex, City Club Casino, Casino Tropez or Titan Casino. Then place the maximum bet on all 20 lines, give one single spin of the Beach Life reels and let luck take hold! If five sun symbols line up on the 20th payline, you win the progressive jackpot. Simple as that! Remember, while the jackpot continues to grow with each spin of the reels, this state of affairs can’t go on forever. It’s got to be won by someone, and the odds are, it’s going to burst sooner than later. The question is, who’s going to walk away with the prize? It could be you, but you can only find out if you play. Remember. Jackpots like this don’t come along every day. In fact, this is an unprecedented amount. Make sure you don’t miss out on the opportunity of a lifetime. Head over to Titan Casino, Casino Plex, City Club Casino, Casino Tropez or Europa Casino now to put destiny in your hands when you play Beach Life slots for the $4.8 million jackpot today. 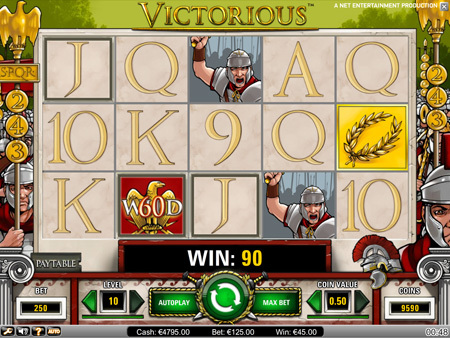 We are pleased to introduce you to Net Entertainment´s latest video slot – Victorious! Get ready for an exciting adventure that spans over kingdoms and battle fields. Whether it is marching into battle or celebrating the latest conquest, everything about Victorious™ creates an air of victory! Victorious™ is a brand new 5-reel slot with massive 243 bet ways to win, appealing to players looking for more ways to win than the traditional winning combinations in a slot. Featuring The Golden Eagle Wild that substitutes for all symbols in both main game and Free Spins provides additional excitement and anticipation. The main attraction in Victorious™ is the Free Spins which is triggered by three or more Golden Wreath symbols and is designed to mirror the cruel battlefield of the gladiators. With Victorious™, Net Entertainment has created yet another video slot with powerful imagery and accompanying sounds that will have players wanting to experience the satisfaction of victory, and have them coming back for more, again and again. Play it here: Betsson Casino, Unibet Casino. In Celebration of Oktoberfest, Casino Tropez is buying all new players a beer in the form of a £5 free bonus. From September 17-October 3, the duration of the official Bavarian Oktoberfest celebrations, new players are encouraged to sign up at Casino Tropez, register an account and make a minimum first deposit in order to claim their festive bonus. A special bonus code promotion, the £5 casino Oktoberfest bonus can be claimed after making a first deposit and contacting Casino Tropez’s Customer Support team with the bonus code "Beer". While only beers brewed in Bavaria are welcome at the Munich celebrations, players who receive the Oktoberfest casino bonus can use the bonus money to purchase any beer of their choosing. This complimentary £5 beer bonus can be used to play any of Casino Tropez‘s 300+ online casino games for further winnings. New slot games such as Mr. Cashback and Tennis Stars as well as new scratchcard games 3 Clowns, Iron Man 2 Scratch and Kong Scratch are included in this promotion. This first deposit bonus offer is in addition to Casino Tropez’s £3,000 Welcome Bonus for which all new players are eligible. Starting with a £100 free first deposit bonus, players can claim up to £3,000 in free bonus money when they join Casino Tropez. Europa Casino‘s Rookie Race promotion offers new players the chance to win part of the weekly £1,000 prize pot in a special tournament restricted to first time depositors. Throughout the month of September, Europe’s leading online casino, Europa Casino, is offering a unique weekly tournament to all new players. First time depositors will automatically be entered in Europa Casino‘s Rookie Race tournament where they will compete against other players for their share of the weekly £1,000 prize pot. In order to partake in the weekly tournament, new players have to make a minimum first deposit of £75 at which point they are entered in that week’s Rookie Race. In total four Rookie Races are scheduled to take place. Each race runs for one week beginning on Thursday September 1. The final race is slightly shorter beginning on Thursday September 22 and concluding on Monday September 26, with the final prize being awarded on Tuesday September 27. Players can follow their position in the race throughout the week and check the final results for that leg the following Thursday. If they are in the top 10, then they must contact Europa Casino’s Customer Support with the bonus code "race" to claim their prize. The Rookie Race prize money is awarded on top of all jackpot money that can be won by players throughout the competition. It is also in addition to Europa Casino’s £2,400 Welcome Bonus. This Europa Casino promotion is open to all new signups as well as all first time depositors. Titan Casino is pleased to announce a special promotion to mark the end of summer vacation, and help players ease their way back into work. With Titan Casino’s Happy Hour Bonuses, all players who make a deposit during Happy Hour (12 noon GMT in Europe, 12 noon EST in Canada) will be eligible for a surprise bonus of up to £50. Players can claim this bonus once per day each day throughout the month of September. As a back to work special, this bonus is only available to players on workdays, Monday through Friday. In order to claim this Titan Casino free bonus, players must simply make a deposit during Happy Hour and contact Titan Casino’s Customer Support quoting the bonus code "smile". According to Robin Steele, Manager of Titan Casino, "The Back to Work Happy Hour Bonus marks the perfect transition from vacation back to the rigor of 9-5. It’s also a great way for players to extend the fun of online gaming to their work day and add a touch of joy to their work lives." All registered Titan Casino members are eligible to claim the workday Happy Hour bonus. New players can also claim their £4,000 Welcome Bonus on top of this special bonus offer. Bonus money can be used to play any of Titan Casino’s 300+ online casino games including new games such as Mr. Cashback slots, Tennis Stars slots, and 3 Clowns scratch.